So to recap, we flew from Manila to Macau on Day 1, immediately took a ferry going to Hongkong and spent 4 days there before going back to Macau, this time with my sister in tow. We decided to allot 2 days and 1 night in Macau so we could thoroughly enjoy the place unlike my previous trips na day trips lang, so we were always in a hurry. This time, we were able to explore the country or town more and chill a bit. Here are photos and stories from our 2 days in Macau! After checking out, we took a bus going to the Star Ferry Terminal which turned out to be wrong. Haha! If you're going to Macau, go to the China Ferry Terminal. That's different from Star Ferry Terminal. Take note! Star Ferry only cater to local boat rides. Baket may bra dito? Haha! Went down at East Tsim Sha Tsui or Mody Road ata. So we went inside and asked where the ferry to Macau is, wala dito guys. Haha! We were told to go to the China Ferry Terminal located along Canton Road, Tsim Sha Tsui, Kowloon. It's more or less a 10-minute walk from Victoria Harbour, TST where Star Ferry Terminal is located. Will miss the busy streets of Kowloon / TST! 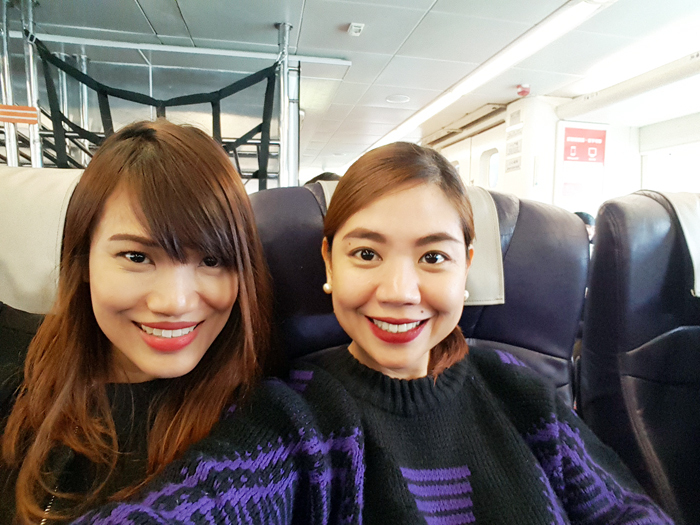 We bought 3 one-way tickets to Macau via Turbojet for $150 HKD each or roughly P950. But first, late lunch or early dinner muna at Cafe de Coral! Ordered fried chicken pero lasang Chinese pa din. Hihi. Paid $27 each or P170. 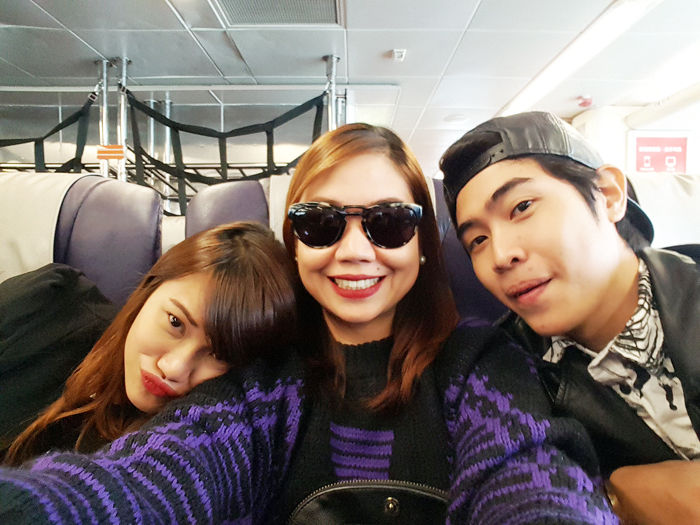 Our ferry or boat going to Macau! After almost an hour, finally docked in Macau! Big hotels provide free shuttle service to and from ferry terminals or the airport. You can hop on these free shuttle even if you're not a guest of the hotel. If ever someone asks, you could always say you're going to their casino! Haha. It's one of the best ways to save money on transportation. We hopped inside Sofitel's shuttle because it's nearest our hotel. This place looks familiar! This is the street heading to Senado Square! We went down at Sofitel and then looked for the exit agad. Haha. Thanks for the free ride, Sofitel! Haha. Nakasave kami dun. From Sofitel upon exit, we turned right, walked straight, went up sa overpass, crossed to the other side and entered a side street. It's just perfect for the 3 of us. 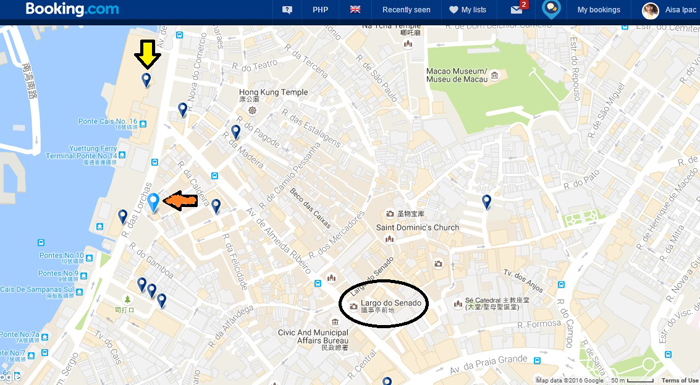 It's location is also very convenient:) Just a 5-7 minute walk from Senado Square! And delicious Portuguese Egg Tart!!! Of course had to have one agad. Saw this chorizo rice vendor! Looked sooo good. We bought from him the next day but I did not like the taste. It's quite malansa. My sister finished her bowl though! The Senado Square, or Senate Square, is a paved town square in Macau and part of the UNESCO Historic Centre of Macau World Heritage Site. Santa Casa De Misericordia or Holy House of Mercy built in 1569 on the orders of the bishop of Macau. It served as a medical clinic, orphanage & refuge for widows of sailors. St. Domingo's or St. Dominic's Church was built in 1587 by 3 Spanish Dominican priests for Our Lady of the Rosary. Koi Kei Shop na naman! Love this cobblestone paved street. Saw a few kababayans drinking Empi lights sa gilid. Hihi. Forever 21 was still open and on super sale, so we shopped a little muna! Got hungry so we bought snacks from this stall. My favorite! The best their fried dumplings. Also love the sausage wrapped in bacon. Decided to continue our exploration the next day, so we looked for someplace to eat. We continued walking and ended up near the Macau Bay. From our hotel we walked towards Senado Square, crossed the street and went inside this alley. Rua De Felicidade or "Happiness Street" is a street in China that has buildings and street painted in red. It was once the heart of Macau's red lights district. Today, it is an authentic shopping street with a few great eateries. See that steep slope? That's where prostitutes and their clients used to meet when opium was still legal in Macau. Did not go inside but I think this is a cafe? So nice. Also saw this nice alley! So photogenic noh? Went up the slope and saw more establishments and restos. There's a stall that offers Filipino dishes! Cool! Saw this Thai resto and decided to eat here! We relied on the photos for our orders. Hehe. My order! Forgot what it's called but it's fried rice with pork & chorizo. Tasty and delicious! 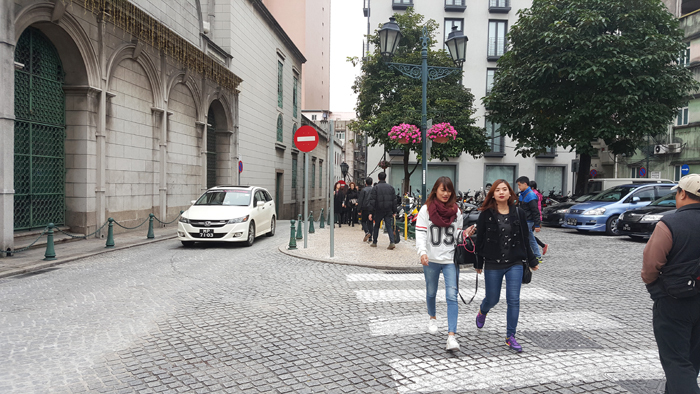 After eating, we continued walking towards Senado Square. It's just easy to find if you have a map. Local pharmarcy. So cute! Lakas maka vintage. Nico decided to try out this local resto. He bought curry soup with I don't know what's inside. Haha! He did not like it. Try pa more. Lol. Sometimes, we forget we're in Macau. Love the fusion of Asian and European architecture everywhere. 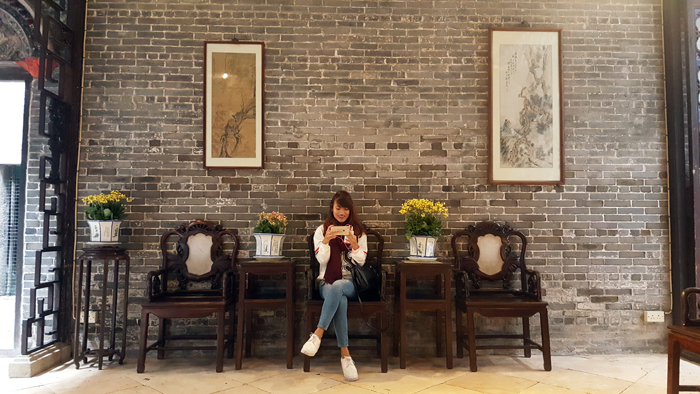 Three courtyards can be found in Lou Kau Mansion for the purpose of better lighting and ventilation. Inside, visitors can find Chinese architectural features coexisting superbly with western styles. To be specific, the Chinese-style brick carvings, wood carvings, and lime sculptures contrast well with the western-style iron handrails, colorful glass, and French windows, making it very interesting and beautiful. So happy coz this place has free wi-fi! Hihi. The brick carvings and the lime sculptures above the doors on the first floor can also be appreciated and studied clearly. The second storey consists of a master bedroom and a living room with a lot of ancient flavor. We were not able to go upstairs 'coz it was closed that time. The window frames are carved with elaborate patterns. The wood boards under the windows bear inscriptions and paintings. In the living room on the first storey stand a row of spectacular screens. Behind them is a door which bears the inscriptions "Great Wealth and High Position". All the front windows towards the street are in Portuguese style, among which the upper two are the most delicate. They are embellished with lime sculptures and the corners are wrapped with metal. The church was established in 1587 by three Spanish Dominican priests who arrived from Acapulco, Mexico. Tarts pa more! $9 hkd per piece or P56. Left Senado Sqaure at around 3pm and decided to go to Venetian Hotel naman. Mejo struggle sumakay ng bus that time coz it was rush hour na. Boarded the same bus #. We got off at Almeida Ribeiro which was just in front of Senado Square. Nico had fun trying out samples of everything. Haha. Nabusog na sha dun. Lol. Hello, Sofitel! Pahitch naman. Haha. But the line was so long! As you can see. Haha. We didn't want to miss our flight so we hailed a cab nalang. I think we paid P600 from Sofitel to the airport. Our flight got delayed so we had to wait for almost 2 hours before we finally boarded. Buti there's free wifi! And then, it was finally time to come home. Bye, Macau! I think 5 days in Macau is enough to cover all tourist spots and all areas. The place is quite small so it's easy to go around. Just don't forget to bring a map! There are still a lot of places I haven't seen like the Macau Tower, some temples and maybe the countryside? Will save that for later. Di kayo pumunta sa Parisian Macao? Or close pa yun nung time na pumunta kayo? Hi Sis Amazing! What po gamit niyong map na app during ng stay niyo sa Macau & Hongkong? And useful po ba? Please reply, thanks po! Ask Ko Lang din po sana kung alam Mo po yung tungkol sa iventure card sa 14 attractions ng Macau and Hongkong Tour. If legit or real po ba na all day pass yun.